Our quality built 120VAC pit flood alarms designed for up to 4 deep pit and equipped with an 8 long power cord, 3-wire grounded plug, and 6 alarm bell. They are extremely adjustable, mounting to 8#, 12#, or 15# rails. One or two liquid level float switches installed on 4 galvanized rigid steel conduits (GRC). Mounting unistrut 1-5/8 x 13/16 x 14 and hardware included. Notes: Float control switch is to be located 12 above pit floor. Alarm bell must be located above high water level or 12 above bottom landing floor. A second float switch (Model PFA2) can be wired to an elevator control circuit, and prevent car to go into the bottom landing if 13 of water present in a pit. 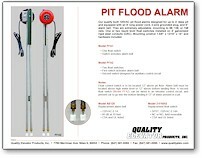 Pit flood alarm PDF flyer.